Have you visited the Underwear For Men Facebook page lately? We are always posting company updates, Manhood Moments, and information for you to read. Our team truly enjoys talking with our customers on a range of topics – from men’s health issues to motivational quotes to upgrading your underwear. Recently, we made some big changes to our Facebook page – and it’s going to make your life that much easier. We are excited to announce that opening of the Underwear For Men Facebook Store. Have you visited the Underwear For Men Facebook page lately? We are always posting company updates, Manhood Moments, and information for you to read. Our team truly enjoys talking with our customers on a range of topics – from men’s health issues to motivational quotes to upgrading your underwear. Recently, we made some big changes to our Facebook page – and it’s going to make your life that much easier. We are excited to announce that opening of the Underwear For Men Facebook Store. Our Facebook page now includes a ‘shop’ feature just above our daily posts. Now, you can just click a pair of briefs or boxer briefs you want to purchase right from our Facebook page and pay right there. You never have to leave our Facebook page to make a purchase. The checkout process is simple and secure. Of course, you can still make a purchase on our main website. 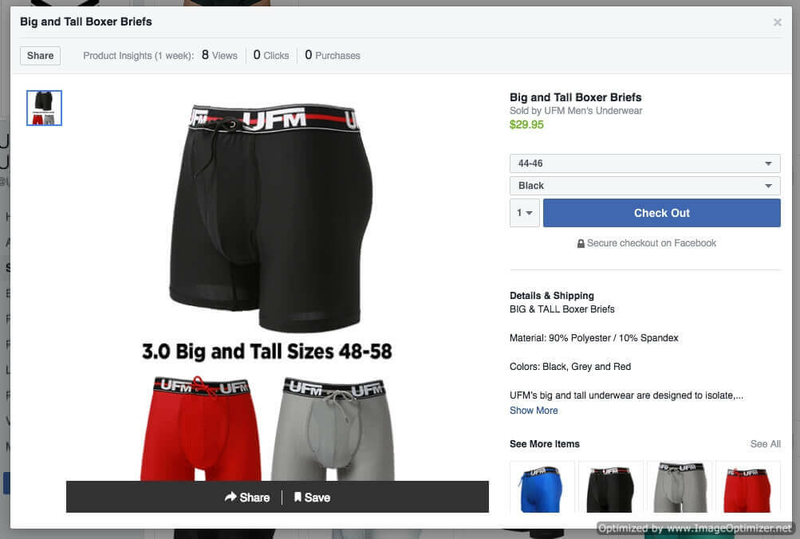 So What Products Are in the Underwear For Men Facebook Shop? UFM started as an idea on Kickstarter for men that need underwear for athletic wear. Underwear For Men is a great solution for men to wear not only for exercise, everyday wear, work, and even medical use. Our company is proud to offer a pouch underwear option that is different than any other men’s underwear out there. We stand out because of our US patented and Intl patents pending adjustable pouch. You simply tie the drawstrings to your preferred fit for gentle support that isolates your manhood. The pouch feels customized to your size and completely eliminates chafing or sticking to the thigh. No matter how many times you wash your UFMs, you won’t experience stretching, fading, or loss of support. Try a pair today to see for yourself just how well our brand supports your manhood.